The FTAN20A is an intercom system that can be used for both homes and businesses. 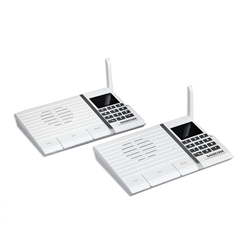 Quick and easy to set up, this model can run without the need for any wires. It can be used at home to communicate with family members in other rooms, the garage or shop. In an office, it can be used for communication between staff in different departments or for emergencies. In medical offices, it can be used to call the doctor or announce patients. The system can be expanded by adding additional FTAN20A desk/wall intercoms, or FPCN10A hand held portable intercoms. Portable units are perfect for mobile staff, security staff, maintenance staff, grounds workers, etc. When installed with multiple intercoms, you can call a specific station or create a group call to reach all stations within the same group. It’s a great way to announce calls in an office or locate a family member in the house when you don’t know where they are. The system has a wireless range of up to 1000 feet direct line of sight. Walls, structures and interference will reduce this range. Installing the intercom is simple, just plug it in using the included power supply, assign a unique number to stations as well as set any group numbers if needed. Stations will retain programming if moved to another room so there’s no need to worry if setups need to be changed.